Floating mats of seaweed, known as sargassum, are home to a wide variety of ocean life. Credit: Steve W. Ross (UNCW), unpubl. data. The daily count of sea creatures dying from coating with oil on the surface of the sea, or on the beaches, continues to rise. We see sea turtles, sea and shore birds, and marine mammals, familiar creatures to us all. As sad as these deaths are, the death toll is massively greater for animals not quite as visible, because they are small, living among marsh grasses, or under the surface of the sea, out-of-sight and thus out-of-mind. The full litany of the dead is deeply disturbing. 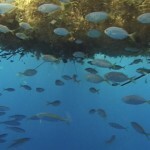 The surface waters of a healthy Gulf swim with life, much of it too small to see. Larvae of shrimp, crab, and other shellfish, and many familiar seafood fishes, spawned at sea, drift toward nurseries in coastal marshes and other shallow waters. Floating mats of seaweed, called sargassum, provide key habitats for babies of many species, now hopelessly contaminated. The interior and underside of these seaweed mats – under normal conditions – are wonderlands of life, as every offshore fisherman knows. 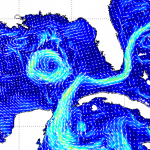 The Gulf Loop Current – a term now commonplace– is a superhighway in the sea for spawned babies of giant tunas, swordfish and other billfishes, groupers, snappers and other reef fishes, and even for hatchling turtles. These creatures ride the current —our version of Nemo’s East Australian Current— toward adult habitats, at risk as they pass through the ‘kill zone’ of oil in the northern Gulf. See an animation of the current loop here and see a video of the oil spreading here. 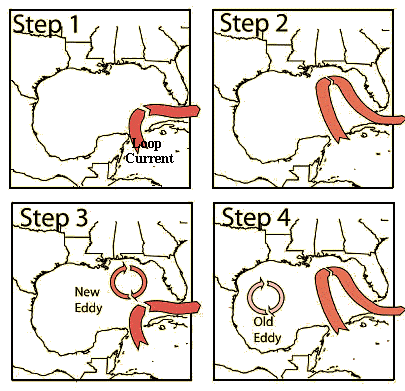 This figure represents the evolution of the Gulf Loop. Credit: NOAA. 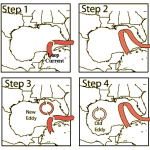 Luckily, the chance development on June 1 of a cutoff eddy—a normal phase in the evolution of the Gulf Loop Current, where the current bends deep enough to interact with itself, ultimately cutting off a spinning gyre in the northern Gulf—has delayed the otherwise rapid delivery of oil pollution to the pristine coral reefs, mangrove swamps and seagrass beds of northern Cuba, the Florida Keys and beyond. 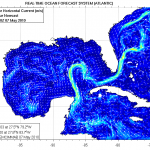 Delivery of oil downcurrent to those habitats remains likely, as the Gulf Loop redevelops. 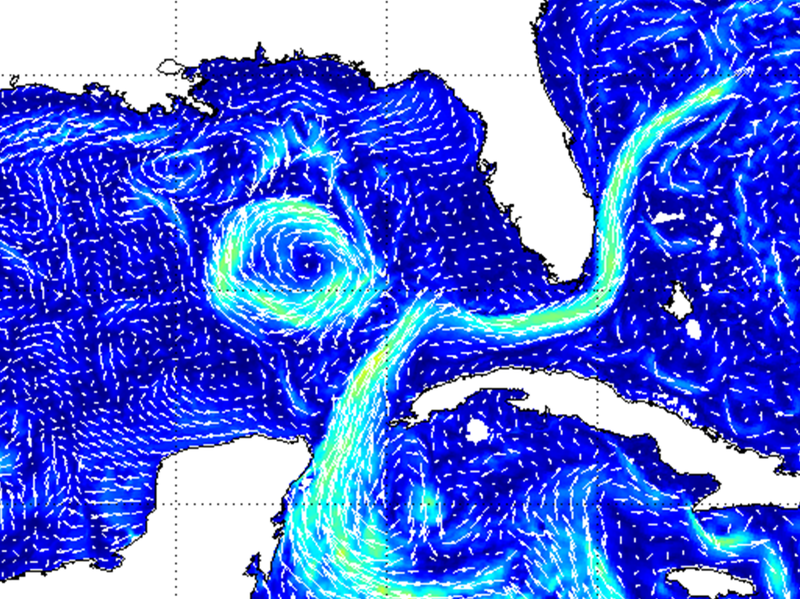 In fact, the weathered oil currently held in the cutoff eddy will likely drift northwest towards the Texas coast. 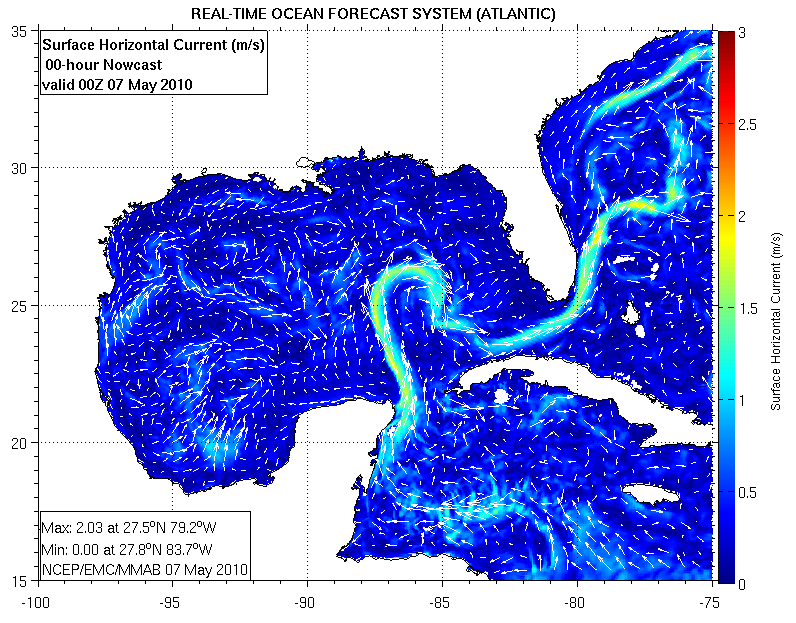 An actual track of a sperm whale diving through rich mid-water feeding zones (shown in green) from the northern Gulf of Mexico. Credit: Modified from Azzara, 2006. Under the surface, hovering clouds of oil pollution drift with the currents, and threaten perhaps the least known elements of this magical world. At middle depths, a profusion of life – shrimps, lanternfish, jellyfish and squids –create a layer of life so rich it appears as sonar returns to surface ships, earning the name “deep scattering layer” to scientists. This rarely imagined world of the deep – key prey for surface diving whales, dolphins, sharks and tunas – is now being contaminated twice, as oil pollution rises to and through it, and as sinking particles carry toxicants back downward. It is no surprise that sperm whales and other deep-feeding life forms we cherish are now numbered among the dead. 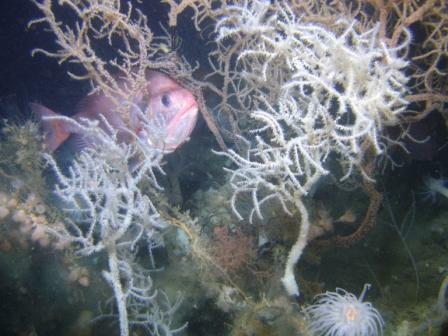 The Visoca Knoll coral reefs are near the Deepwater Horizon well and are home to a rich variety of life. Credit: Steve W. Ross (UNCW), unpubl. data. On the bottom, the corals and worms get the short end of the slick. 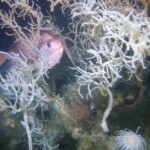 The deep-origin oil spewing from the crippled well is polluting deepsea wonderlands that are just now being discovered, notably majestic and ancient deepwater coral reefs. The vast majority of the oil that remains in the sea will ultimately find its way to the seafloor, where worms and other sediment-eating life forms will ingest it, be ingested in turn, and continue contaminating food webs – and the very web of life – for generations to come. Put all together, every important part of the broader Gulf of Mexico marine ecosystem – upon which so many people rely for their income, and their way of life – is taking many potential knockout blows. Productivity of key seafood species could be depressed for years if not generations to come. Special care will be required to ensure that Gulf seafood remains safe. There is plenty to cry about, both on the surface and in the unseen places in the deep.